An article which covers excerpts from a presentation given by Brian Becker on the possible meeting of the US president Trump and the DPRK leader Kim Jong Un. has been published on Liberation. Becker indicates that DPRK does not hope for a "security guarantee" from the US and only desires a normalization of relations between the US. DPRK does not seek "security guarantee" from the US. It pushes for normalization of relations between the US and DPRK. Becker noted that DPRK is not illusioned about the US agenda towards them. He said that they are well aware of the US' final goal would not change no matter what: that is a "regime change in DPRK" namely the abolition of Workers' Party government and integration of the country into the world capitalist system. Becker reminded that all of the previous experiences about the imperialism willing to improve "normalized relations" with socialist states, proved the normalized relations doesn't mean giving up of the goal of regime change. Then he referred specific examples such as the US's normalization processes with USSR, PRC, and Cuba. Brian Becker also made some comments on motivations of DPRK and the US. About motivations of the US, he compared Trump's willingness to meet Kim Jong Un despite being a far-rightist politician with Nixon's normalization process with the Republic of China in the 1970s. Becker argued that Trump as "a mid-level real estate developer and reality TV personality whose star was in eclipse before he ran for office" is desirous of being the president "who ended a war that longs for 68 years." He also added that other ruling class forces in the US, especially the conservatives, are very disappointed about Trump's recent U-turn in Korea politics and presses in order to prevent such process. Finally, Becker stated that the socialists' policy towards socialist countries' and anti-imperialist governments' "normalization" processes with imperialism should be supporting, knowing the necessity of it while resisting the counter-revolution. DPRK used the Obama's "strategic patience" policy towards DPRK nuclear programme by improving both it's nuclear capabilities and missile technology. During the first year of Trump administration, DPRK became a "nuclear power" which is capable of reaching the US soil. DPRK also used the opportunity that came out with the Moon Jae In presidency, who is a liberal politician works with former participants of the radical student movement repressed by the US-backed military dictatorship, in the South, implementing the peace and reunification talks with South Korea. In the new years eve, the president of DPRK, Kim Jong Un told that they achieved the task of creating a nuclear deterrence against imperialism and it was time to proceed towards other priorities like reunification. 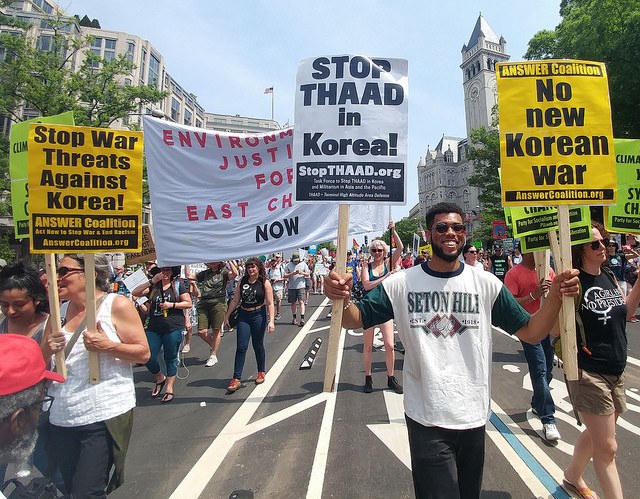 DPRK previously stated that only if the whole Korean peninsula was denuclearised, the US troops in the peninsula were withdrawn and the US declares that it would not use nuclear weapons against DPRK under any circumstances, then DPRK would give up its nuclear programme for good. See the link for the full article on Liberation.